Downloading copyrighted sounds from call manufacturers websites, for use as homemade calls, without their express written permission is THEFT!! There are no other words for this; it is illegal and punishable under copyright laws of the US and other countries. Predator Masters and its affiliates are strongly against using pirated sounds and in no way condones the use of these instructions for the purpose of stealing copyrighted information, software or electronic files and media. Use of these instructions for the purpose of stealing could result in permanent removal, and may keep any future instructional articles from being published. There are free sounds all over the Internet that can be downloaded and made to be just as effective as ANY commercial media!! Be responsible and ethical..Don't ruin it for everyone!! By writing this article, I only intend to offer my advice as learned from trial and error in the process of making homemade electronic calls. My experience has been gained from reading many articles on the subject and by participating in the use of bulletin boards and web sites, learning everything I could to make my own electronic caller. This has now evolved into making my own electronic calls and putting them on CD. I enjoy helping others avoid the blood sweat and tears, and the many sleepless nights I've lost in this new found addiction that I call a hobby. There are probably as many methods for calling in predators as there are opinions on the matter; one of the most popular methods is the use of electronic calls. These calls vary by features, sounds produced and techniques of the users. While mouth blown calls tend to be more accurate, electronic calls are gaining in popularity and are what I will discuss here, because this is where most of my experience lays. There are many different brands of commercial electronic callers available on the market, and as mentioned above, each has it's own features and vary greatly in cost. I have used popular commercial callers and have learned to build my own. As far as effectiveness, there is no noticeable difference between theirs and mine. Many of us are on limited budgets and simply cannot afford to spend a couple of hundred dollars on commercial callers and tapes and CD's and mouth blown calls and the list goes on. This is why I decided to build my own, from plans I found on the Internet, changed to my satisfaction and budget and ended up with my final creation, but that's another article and there will be more on homemade electronic callers in the future. Many sounds, known as "Waves" or .wav files in their electronic form, can be used for calling predators, these can be found on the Internet with the use of most popular search engines. There are even search engines that are specifically made for finding sound files, such as www.findsounds.com. But most search engines are capable of finding these. The key to searching for these sometimes hard to find files is your search criteria, in other words, what words you use to search with. For example, if you go to a search engine such as Yahoo and type "animal sounds" in the search box, you will undoubtedly return several dozen pages of information regarding animal sounds, far too many to be able to effectively search through. However, if you were to narrow your search to a particular animal, chances are your return would be more manageable. Be creative in using different key words for your search, if one doesn't work, then use a different one. and choosing the location on your computer in which you want to save your file. I would recommend that you gather as many sounds as possible before beginning to mix and create your CD's with, as you may come across a better sounding file or decide to mix more than one sound to make a more effective call. Once you have gathered a few sound files, you will need to download a sound editing software before you can make a complete call. 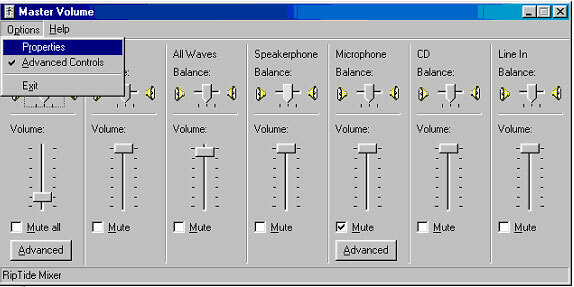 Sound editors can be found at many freeware or shareware download sites, such as www.download.com or www.shareware.com with a simple search for, you guessed it, sound editor. I use and recommend Goldwave for editing sounds, it's easy to understand, simple to use, offers many features and has easy to follow directions. It is available for free download and use from www.goldwave.com. After you have downloaded and installed Goldwave, or your choice of sound editor, open the program by locating it on your computer and double clicking its icon. When the program opens up, click on File and select Open, and direct it to the folder in which you saved all of your sound clips to. It would be a good idea at this point to explore and play around with your files while reading the instructions, this way you can learn through performing the different options available to you via your sound editor. Further in the article will be more detailed information on the use of Goldwave. I've also written up some instructions on the use of Goldwave, the link to that page is at the bottom. If you care to record your current tapes or CD's to the computer for cleaning up or for customizing, the following steps should assist you through the process. First of all you will need the proper equipment to accomplish this task, which can be bought for a reasonable price from Radio Shack or another electronics store. You will need a 6 ft cable Radio Shack #4202420 (Cost $2.69 at the time of this writing) and a tape or CD player with an earplug jack. Now, with one end of the cable, plug in to your computers MIC in jack located on the back of your CPU (computer) or on some machines through the monitor. With the other end, plug into the earphone jack of the tape or CD player. 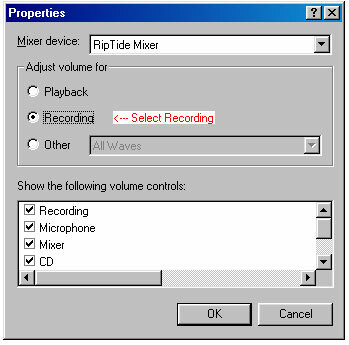 Now that you have everything plugged in, you'll need to go to your computer recording settings or if you downloaded Goldwave you can click on NEW, which will open a new window to record your sound to. If you are using your computers default sound recorder you will need to make a few minor adjustments to the recording properties before you can begin, the following instructions will explain in detail what you should do. 2. On the volume properties box, click on Options, this will open a drop down box, as pictured below, now click on Properties, this will open the controls to make your final adjustments. 3. On the properties window you will need to select Recording and make sure in the window below the recording option that "Line In" has a check in the box next to it. 4. You should be ready to record at this point. So start your player and find where the sound will begin, there is no need to record the dead or silent space at the beginning, as this can be put back after you have completed your recording. When you have found where the sound begins, click on record in your sound editing or recording software and push Play on your Player. 6. Now that you have recorded and saved your sound, you can clean any clicks or hiss that may be present, and begin customizing the sound by mixing it with others, by using the Goldwave program. 7. It is recommended that you not save the file until you are totally satisfied with the end result, usually what I do is save the file as a different name, and keep the original clip in case I want to use it for something else in the future. This pretty much sums up the recording section of your sounds, if there is any problem or if I have left anything out, please feel free to send me a message at Robert@PredatorMasters.com and I will gladly assist you and answer any questions you may have. Click Below for Instructions on Goldwave! © 2000-2006 Predator Masters, All Rights Reserved. This material may not be published, broadcast, rewritten, or redistributed.